Summary: Memory foam is taking over the pet world. The numerous health benefits stemming from the switch is revolutionary. When you think memory foam, you might refer to something that only you and your significant other would sleep on to get that “good night’s rest”. Alternatively, did you know that memory foam can replicate the exact same benefits for your beloved dog as well? Many manufacturers are pumping out new models of dog beds that incorporate the use of memory foam to keep your dog comfortable throughout the night. It’s been well-known now that memory foam is the ultimate pressure-relieving material out there. This revolutionary breakthrough has changed the way people are sleeping by conforming to the body’s shape, resulting in a comfortable and natural sleeping pattern. Now, if you’re looking to find a memory foam bed for your dog, there are numerous things that you should keep an eye out for. As stated before, ever since memory foam beds have hit the market, people are benefitting by reduced back soreness, stiffness, and grogginess. The ‘open-celled’ composition and temperature sensitivity of these memory foam custom cushions allow for a balance between comfort and support. Remember, your dog needs attention to his or her back and spine as well. By giving your buddy a memory foam bed to sleep on, you’re essentially keeping an eye on his or her health as well. Many of these dog beds are designed to react to a dog’s bodily temperature and weight. Similar to mattresses, it will also conform to your dog’s body – from every curve to every angle. Depending on the range of temperatures, the memory foam will eventually soften, leaving your dog to be enveloped in a soft, fluffy, and heavenly blanked. 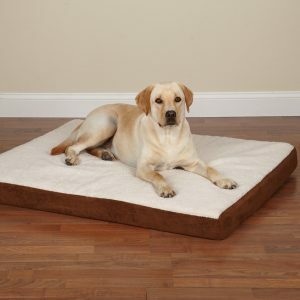 Supporting your dog with a memory foam bed is beneficial for their spinal alignment, posture, and health conditions. Dogs that suffer from hip or elbow dysplasia, joint problems, arthritis, or other health issues can truly benefit from a memory foam bed. If you’re the owner of a young puppy, you could replace his or her normal bed with one that is made from memory foam to allow their joints to develop in a healthy fashion. And, puppies tend to grow pretty quickly, you’ll want them to grow up to be strong and active, rather than suffer from inflammatory joints for the rest of their lives. Your pup has earned it, why not give him or her a luxury that will provide relief and comfort. Bio: Foam Factory, Inc. manufactures the finest dog beds in Canada. For more information, visit them online today.